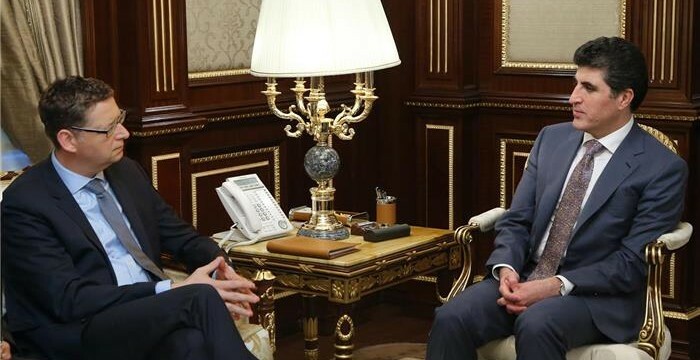 Erbil, Kurdistan Region, Iraq (cabinet.gov.krd) - Prime Minister Nechirvan Barzani yesterday met Thorsten Schäfer-Gümbel, Deputy Head of the Social Democrat Party in the German Parliament and his accompanying delegation. 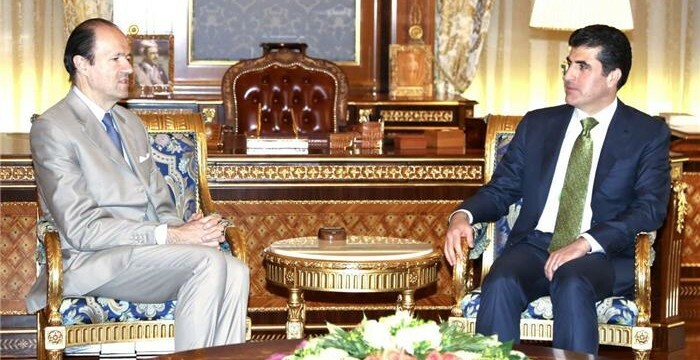 Mr. Schäfer-Gümbel reaffirmed his country’s support to the Kurdistan Region in military, humanitarian and economic areas to help overcome the challenges facing the Region, and noted his party’s role in offering military aid for Peshmerga forces in the fight against the Islamic State terrorist organization, ISIS. The Prime Minister expressed his gratitude to the German public, government and parliament for their ongoing support to the Kurdistan Region, and praised Germany’s role in sending military support, treating wounded Peshmergas and ISIS victims, particularly the Yezidi Kurds. Prime Minister Barzani gave an overview of the current situation in the region, including the fight against terrorism and other challenges, particularly the financial crisis gripping the Kurdistan Region, stating that assistance from the international community is needed to overcome them, particularly the expertise and skills to implement reforms. The Prime Minister also discussed the formation of a committee in charge of resolving the recent political issues, which affected the Parliament and Government. He expressed his hope that all political sides will reach agreement. Prime Minister Nechirvan Barzani met yesterday with Jean-François Girault, Director of the Middle East and North Africa Department of the French Ministry of Foreign Affairs, to discuss the current situation in Iraq. In the meeting, discussions centered on developments after the seizure of Mosul and other areas by the Islamic State of Iraq and al-Sham (ISIS) terrorist organization, the threat of terrorism, and the consequences of such events, including the displacement of the hundreds of thousands of civilians now being sheltered in the Kurdistan Region and receiving emergency support by the KRG. Director Girault emphasised that terror is a global issue, and it is therefore the responsibility of the international community to confront it. He added that the issue of terrorism in Iraq cannot be solved through military operations alone but requires a political solution. Prime Minister Barzani explained that Iraq after the fall of Mosul is very different than it was before, and the current circumstances necessitate an entirely new approach. He reiterated that any solution must be based on the new reality in Iraq. The Prime Minister also pointed to the importance the KRG attaches to its relationship with France, and he thanked Director Girault and his accompanying delegation for their position against terrorism in all forms. 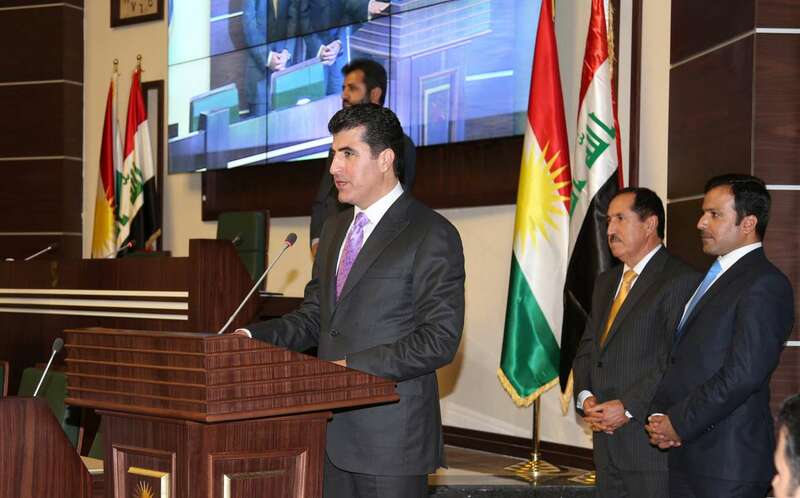 The eighth cabinet of the Kurdistan Regional Government was announced at a special session of the Kurdistan Parliament held on 18 June 2014. Prime Minister Nechirvan Barzani, Deputy Prime Minister Qubad Talabani, and all cabinet ministers were sworn into office. In a speech outlining the programme of the eighth cabinet, Prime Minister Barzani stated that the new cabinet has been announced during a critical point in time. He emphasised that in 2003, the people of Kurdistan needed to act with one voice and work together in order to protect and preserve the achievements and interests of the Kurdistan Region. He noted the need to have the same strategic posture at this difficult period for Iraq in order to not squander any achievements that have been made and to ensure the safety and security of those living in the Kurdistan Region and in parts of Kurdistan outside of KRG administration. For this reason the decision constitutes a historic responsibility for the people of Kurdistan. The Prime Minister also said that the eighth cabinet is a broad-based government, reflecting the aspirations of the political forces in the Kurdistan Region. Achieving this task required patience during the process of forming such a cabinet in order to construct a real partnership that would respond to the current needs of the people and the political constituencies of the Kurdistan Region. Prime Minister Barzani thanked the people of the Kurdistan Region for their patience during the government formation process, especially after Iraq’s federal government cut the salaries of KRG employees. He stressed that this unjust and unconstitutional decision has made the lives of the people in the Region more difficult and has also had a negative impact on Kurdistan’s economy and investment. He expressed his sorrow and sadness for the trouble that this situation has caused for the people of Kurdistan. However, he stated that in the coming years the resistance and fortitude of the people of the Kurdistan Region would usher in a new stage in which injustice would be confronted. This would help to settle these issues, and the Kurdistan Region would not face political or financial crises such as this again. The Prime Minister discussed the plans of the new cabinet, highlighting the fact that all efforts will be made to incorporate a hard-working and transparent government based on the principles of citizenship, separation of powers, peace and social justice, human rights and particularly the rights of women and children, the rule of law and justice, increased prosperity, genuine reform, protection of the Kurdistan Region’s environment, and the identification of appropriate solutions to combat corruption in all of its forms in KRG institutions. He also explained that citizenship would become the principle, the value, and the primary measurement of government activities. The cabinet will work to provide equal opportunities for all inhabitants of Kurdistan regardless of their political, ethnic, or religious affiliation. In addition, based on the mechanism of the rule of law and institutionalization, the new cabinet will work to ensure that institutions and government duties, authorities, and responsibilities are separate from the activities and duties of political parties. Prime Minister Barzani reiterated that the eighth cabinet is a coalition government and that its components are genuine partners in this government. This includes at the level of implementing government duties, decision-making, and responsibility for all decisions. This government belongs to everyone in Kurdistan and works for citizens’ prosperity and interests and to provide them with services. He also indicated that those serving in the cabinet would be committed and qualified to handle the government’s economic, financial, and administrative responsibilities. Members of the government will all be responsible for its decisions, he said, and no side will be an obstacle in implementing the government’s decisions. The different parties that come together to form this cabinet will govern the Region based on the votes and confidence the people have entrusted to it. The government will work resolutely to deliver on the promises made to the people and will serve them. Prime Minister Barzani pointed out that the participation of various political parties in the coalition government would help to reinforce the foundations of democracy and peaceful coexistence, respecting differences in views, freedom of the press, and governing and working together under the same umbrella. This will bring the tolerance of the people of Kurdistan to a new stage in the Region’s political history. He also stressed that the government should take significant steps in order to help realize the dreams of past generations: bringing about a self-governing, stable and secure Kurdistan. This is why the government will responsibly identify the necessary steps to be taken for the future. Regarding the problems between Baghdad and Erbil, Prime Minister Barzani underlined that one of the duties of the new cabinet will be to adopt a reconciliatory policy to settle the unresolved issues and the Region’s future with Iraq’s federal government. This includes, especially, the issue of the areas of Kurdistan outside KRG administration and the implementation of Article 140 of the Iraqi federal constitution. He stressed that together, in coordination with the Region’s presidency, the parliament, and in cooperation with political parties, urgent steps would be taken to establish a negotiation council for political agreement that reflects the will of the people of Kurdistan. The Prime Minister stated that the eighth cabinet would create a suitable environment to ensure that the parliament can properly monitor the government’s activities. Meanwhile, he sought the trust and support of the parliament so that the government and the parliament work together to serve the people of the Kurdistan Region. To this end, the government will be in constant communication with the parliament and its chairmanship council. He also pointed out that, as Kurdistan is a relative rich Region, the current objective is to achieve economic independence, continuous growth, and diversification of income sources – thus avoiding reliance on natural resources revenues alone. He said that the government will work to develop various sectors, including agriculture, industry, trade, services, and would strive to reduce the difference in living conditions between towns in the countryside and cities. Prime Minister Barzani explained that the government will work to improve major water services, electricity, and road networks to meet the clear economic growth and increased standard of living in Kurdistan. The KRG would also promote local and foreign investment by utilizing the Region’s capabilities, materials, and human resources. This requires active work to implement decentralization, separation of powers, and reach an agreement to amend the laws. The Prime Minister stated that the government will pay special attention to the sectors of industry and tourism and will support the private sector to play its role in reconstruction and propelling the economic growth of Kurdistan. The government will improve the investment framework in Kurdistan in a way to meet the social and economic development for the next stage of the Region. He indicated that the eighth cabinet will continue to reform the education and higher education systems by providing the needed facilities, improving academic capacity, and developing scientific research and vocational studies to create a qualified and capable workforce for the job market. Reducing the rate of illiteracy in the Region will also be a priority. Regarding the health sector, Prime Minister Barzani explained that the new cabinet will work to adopt a more modern health system and separate public and private sector medical services. He said that the eighth cabinet will continue to pay attention to the lives and living conditions of the families of martyrs, victims of the Anfal campaign, chemical weapons attacks, and political prisoners. The new cabinet will reframe its programme regarding the housing sector in a modern way and will work to solve housing issues, especially for low-income families. The Prime Minister told the parliament that all should be proud of the security and stability that prevail in Kurdistan, despite its location in the heart of an area torn by violence, war, terror, and repression. The situation in Kurdistan has been enabled by the efforts, awareness, and conscientious efforts of the Peshmerga, police, and security forces who work for all the people of Kurdistan. Because of this, the KRG strives to improve the lives and living conditions of the Region’s armed forces and enhance their abilities and skills. Strengthening the sense of national loyalty to the armed forces will be an important task of this government. The eighth cabinet will work to review and regulate the pension and salary system to benefit people in a fair way. It will work to establish the Kurdistan Fund for Oil Income and the Region’s Petroleum Company, as stipulated by Kurdistan Region Oil and Gas Law number 22 of 2007. The Prime Minister outlined the cabinet’s plan to develop, support, and encourage the local private sector and provide suitable conditions for foreign companies and investors in order to create job opportunities and reduce the rate of unemployment. This refers particularly to youth and graduates of institutes and universities. The government will adopt modern operational employment policies and strive to eliminate manipulation in the private market, companies, and investment. The Prime Minister explained that this is the general overview of the coalition government’s action plan, which will form the basis of the policies and projects of the government, and will be reflected in the work and programmes of the ministries. Prime Minister Barzani concluded by emphasizing that the adoption and the success of the government’s programme will be a success for the resilient people of Kurdistan – people who have suffered for a long time. Providing social and economic services is an honour for the government. The people of Kurdistan deserve a brighter future; they deserve freedom, liberty, and a more robust democracy. With the backing of security, Peshmerga, police forces, and the people, he said that the Region could achieve better results and make greater dreams come true.